When is it Time to Guess on Quant? So you’ve been told over and over that guessing is an important part of the GMAT. But knowing you’re supposed to guess and knowing when you’re supposed to guess are two very different things. Here are a few guidelines for how to decide when to guess. But first, know that there are two kinds of guesses: random guesses and educated guesses. Both have their place on the GMAT. Random guesses are best for the questions that are so tough, that you don’t even know where to get started. Educated guesses, on the other hand, are useful when you’ve made at least some progress, but aren’t going to get all the way to an answer in time. Here are a few different scenarios that should end in a guess. Scenario 1: I’ve read the question twice, and I have no idea what it’s asking. This one is pretty straightforward. Don’t worry about whether the question is objectively easy or difficult. If it’s too hard for you, it’s not worth doing. In fact, it’s so not worth doing that it’s not even worth your time narrowing down answer choices to make an educated guess. In fact, if it’s that difficult, it may even be better for you to get it wrong! To make the most of your random guesses, you should use the same answer choice every time. The difference is slight, but it does up your odds of getting some of these random guess right. Scenario 2: I had a plan, but I hit a wall. Often, when this happens, you haven’t yet spent 2 minutes on the problem. So why guess? Maybe now you have a better plan for how to get to the answer. I know this is hard to hear, but don’t do it! To stay on pace for the entire section, you have to stay disciplined and that means that you only have one chance to get each question right. The good news is that no 1 question you get wrong will kill your score. But, 1 question can really hurt your score if you spend too long on it! Once you realize that your plan didn’t work, it’s time to make an educated guess. You’ve already spent more than a minute on this question (hopefully not more than 2! ), and you probably have some sense of which answers are more likely to be right. Take another 15 seconds (no more!) and make your best educated guess. Scenario 3: I got an answer, but it doesn’t match any of the answer choices. This is another painful one, but it’s an almost identical situation to Scenario 2. It means you either made a calculation error somewhere along the way, or you set the problem up incorrectly to begin with. In an untimed setting, both of these problems would have the same solution: go back over your work and find the mistake. On the GMAT, however, that process is too time-consuming. Plus, even once you find your mistake, you still have to redo all the work! Once again, though it might hurt, it’s still in your best interest to let the question go. If you can narrow down the answer choices, great (though don’t spend longer than 15 or 20 seconds doing so). If not, don’t worry about it. Just make a random guess and vow to be more careful on the next one (and all the rest after that!). Scenario 4: I checked my pacing chart and I’m more than 2 minutes behind. Pacing problems are best dealt with early. If you’re more than 2 minutes behind, don’t wait until another 5 questions have passed and you realize you’re 5 minutes behind. At this point, you want to find a question in the next 5 that you can guess randomly on. The quicker you can identify a good candidate to skip, the more time you can make up. This is another scenario where random guessing is best. Educated guessing takes time, and we’re trying to save as much time as possible. Look for questions that take a long time to read, or that deal with topics you’re not as strong in, but most importantly, just make the decision and pick up the time. Remember, this test is not like high school exams; it’s not designed to have every question answered. This test is about consistency on questions you know how to do. Knowing when to get out of a question is one of the most fundamental parts of a good score. The better you are at limiting time spent on really difficult questions, the more time you have to answer questions you know how to do. Plan on taking the GMAT soon? We have the world’s best GMAT prep programs starting all the time. And, be sure to find us on Facebook and Google+, and follow us on Twitter! Manhattan GMAT’s Live Online Spring P2 Course is a comprehensive GMAT course designed specifically for high-achieving, international students looking to earn an MBA from a top business school. Taught by famed GMAT instructor, Ron Purewal, our Live Online Spring P2 Course will be hosted in the early morning (5:30AM-8:30AM PDT) from Silicon Valley, California. We’re inviting students from all around the world to join, with the hope that this unique time will fit more conveniently into international students’ schedules. The course aims to teach mastery of GMAT content and the test-taking skills and strategies that are necessary to conquering every question type with confidence. • 54 hours of class time & coaching – at a time specifically selected to best support international GMAT test-takers. 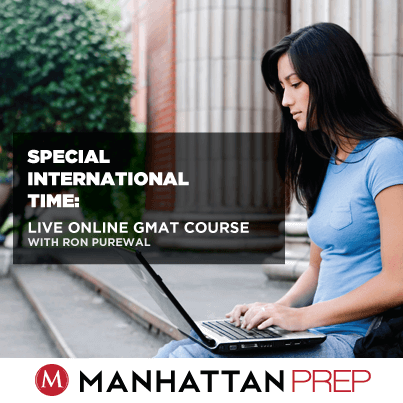 Space is limited and filling quickly, so be sure to register for Ron Purewal’s upcoming Live Online GMAT Course at this special international time before it’s too late. Not sure if this class is right for you? Attend the first session for free and try it out before signing up for the complete program. Are you ready for the 2014–2015 MBA application season? 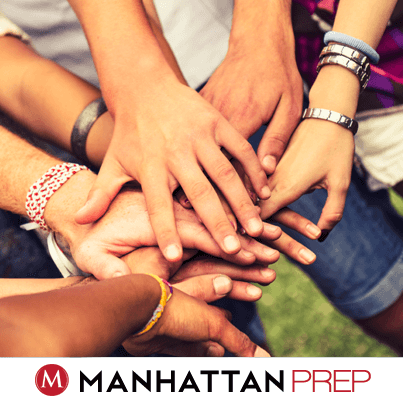 Join Manhattan Prep, mbaMission, and Poets & Quants for a free, five-part webinar series to help you prepare! 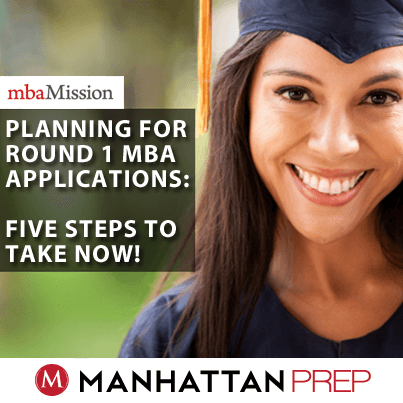 Three leaders in the MBA admissions space—Poets & Quants, mbaMission and Manhattan Prep—are banding together to ensure that you will be ready for the 2014–2015 MBA admissions season. 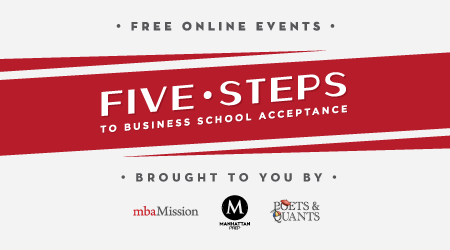 Together, we are launching a free, five-part webinar series entitled “Five Steps to Business School Acceptance”! In each of the first four sessions, a senior consultant from mbaMission will address and explain a different significant admissions issue, while Poets & Quants’ John Byrne serves as host, moderating any questions and answers. 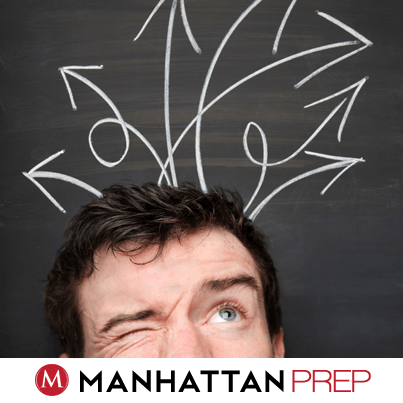 Then, an expert from Manhattan Prep will present a challenging GMAT issue, offering insight, advice and more. The fifth and final session consists of a discussion panel with current admissions officers, sharing their thoughts and answering questions about the upcoming admissions season. Session 1: March 19, 2014 – Watch the recording of our first session here to see what all of the buzz is about! Do you have questions for our GMAT and MBA admissions experts? Ask them in the comments below, and we will do our best to answer them in the Q&A sessions following each presentation, or reach out to use on social using the hashtag #fivesteps. Pocket GMAT 2.0: New Updates are Now Available! 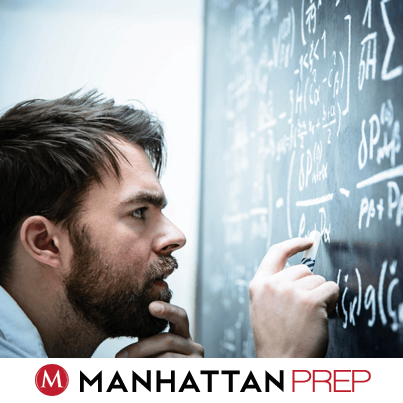 Containing over 350 GMAT quant flash cards, Pocket GMAT uses an adaptive algorithm developed by Manhattan Prep instructors to help you target cards you most need help with. Allowing you to strengthen your GMAT quantitative skills anywhere and at any time, the Pocket GMAT app is an indispensable tool for iPhone users. The app also now works better on iOS6 devices and we have fixed issues with scrolling and swiping, so overall navigation is smoother. We’ve also fixed content errata and made the images look better. 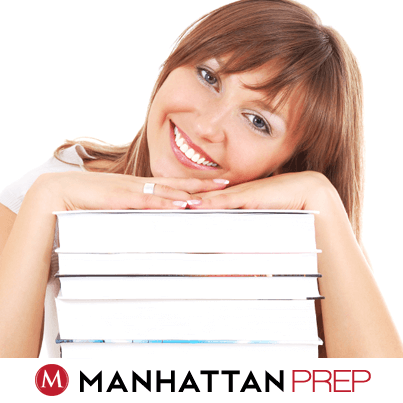 Manhattan Prep has teamed up with Learningpod to make Pocket GMAT free for everyone! In addition to the adaptive algorithm, there is also a sequential practice mode that lets you flip through the cards however you want. You also have the ability to enter a Target Date to keep you on pace and track your progress. The flash cards are organized into “KeyRings” by topic and include algebra, number properties, word problems, geometry, fractions, decimals, and percents. We hope the new updates improve your studying experience, and if you’re as excited as we are about the revisions, please let us know in the review section of the App store. We use your feedback to make our study tools the best they can possibly be! You’ve heard a million times that you’re supposed to create Official Guide (OG) problem sets in order to practice for the test. But how do you actually do so in a way that will help you get the most out of your study? Fear not! This article is coming to your rescue. Initially, when you’re studying a new topic or problem type, you won’t do sets of problems; instead, you’ll just try one problem at a time. As you gain experience, though, you’re going to want to do 3 problems in a row, or 5, or 10. Because the real test will never give you just one problem! The GMAT will give you many questions in a row and they’ll be all jumbled up—an SC, then a couple of CRs, then back to another SC (that tests different grammar rules than the first one), and so on. When do I start doing problem sets? You’re going to use problem sets to test your skills, so you’ve got to develop some of those skills first. If you’re using our Strategy Guides to study, then at the end of one chapter, you’ll do only two or three OG problems to make sure that you understood the material in the chapter. Later, though, when you finish the Guide, do a set of problems that mix topics (and question types) from that entire book. Make sure you can distinguish between the similar-but-not-quite-the-same topics in that book, and also practice your skills on both problem solving and data sufficiency. As you finish subsequent Guides, your sets can include problems from everything you’ve done so far. Keep mixing it up! How do I make the sets? (1) Number of problems. Initially, start out with about 3 to 5 problems. As you gain experience and add topics, you’ll increase the size of the sets—we’ll talk more about this a little later. (2) Type of problem and content. (a) For quant, always do a mix of Problem Solving (PS) and Data Sufficiency (DS). For verbal, mix at least two of the three types; you can include all three types in larger sets. (b) Do not do a set of 3 or more questions all from the same chapter or content area—for example, don’t do 3 exponents questions in a row. You know exactly what you’re about to get and the real test will never be this nice to you. (b) Note: your personal strengths and weaknesses will affect how you perceive the problems—you might think a lower-numbered problem is hard or a higher-numbered problem is easy. They are… for you! Expect that kind of outcome sometimes. Next, calculate how much time to give yourself to do the problem set. Planning for Round 1 MBA Applications (2014): Five Steps to Take Now! 1. Visit Schools: Visiting schools is a smart move for you as a potential consumer of a $100K+ education (not including living expenses and lost salary during your two years of study). It is also a smart move for you as an applicant, because traveling to a school serves as a strong indicator that you truly do want to attend that target program. Sure, some schools’ admissions offices state that the class visit is not overly important (notably, Harvard Business School), but most programs appreciate the gesture, because it demonstrates your level of interest and shows that you are not just selecting the school on the basis of rankings—you have “kicked the tires” and decided to proceed. Many applicants will not think about making a class visit until too late. Class visit programs typically wrap up in April/May and do not open up until after Round 1 applications are due. So, if you have not yet visited your target school, your time is running out, and this might prevent you from learning more about the program and making an important positive impression. Schedule a visit now!